Min Sik Kim is charged with second-degree murder in the death of Jakeel Mason. In Washington state, a convenience store clerk has been charged with second-degree murder after fatally shooting a would-be shoplifter in the back as he attempted to flee. The clerk says it was self defense, but according to authorities, surveillance video of the shooting says otherwise. 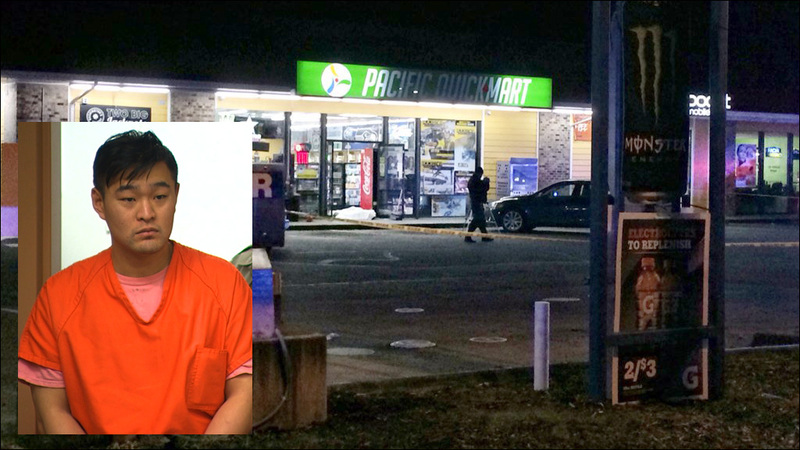 30-year-old Min Sik Kim, owner of the Pacific Quick Stop in Spanaway, was charged Tuesday with second-degree murder in the death of 21-year-old Jakeel Rashon Mason. He pleaded not guilty. Prosecutors say surveillance video of the shooting shows Kim holding Mason at gunpoint, punching him in the face, then shooting him twice in the back as he tried to run away. Kim went outside the store about 9:45 p.m. to tell a group of men who were loitering and drinking alcohol to leave. While Kim was outside, Mason took several packs of cigarettes from behind the counter and tried to shove them into his pockets. After a customer told Kim what was happening, he ran inside the store and pulled out a handgun, pointing it at Mason. Kim then holstered the gun and punched Mason in the face. The men began fighting, with both throwing punches. Mason eventually freed himself and started for the door. Surveillance video "shows Kim positioned himself behind Mason, having to clear himself from a shelf containing merchandise," records show. "Kim raised the gun and shot two rounds at Mason as Mason neared the door in an effort to flee." Mason was shot twice in the back. Kim told investigators that he pulled his gun out and shot Mason during the struggle. But prosecutors say the store's footage shows that Mason was no longer a threat to Kim and was running away when he was shot. "The defendant's frustrations are understandable, but his actions were not lawful," Pierce County prosecutor Mark Lindquist said in a statement. "Shop owners cannot legally shoot unarmed shoplifters attempting to flee." This was reportedly the second shooting at the store in just over a month. Kim's wife was shot in February during an attempted robbery in which she and the would-be robber fired at the same time. The suspect in that incident was unharmed and later arrested and charged.